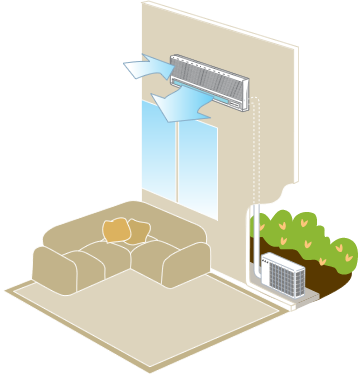 What Is A Ductless Mini-Split System | Pleasant Air Inc.
and electrical power lines, install the wall controller, and the job is done. on automatically before the homeowner arrives home from work. The indoor unit of a ductless system is lightweight and comes in a variety of shapes and sizes to fit any design scheme. Outdoor units are designed to be efficient and durable, and they are smaller than conventional units, which makes them easier to disguise behind existing landscaping. To cool your home, refrigerant is pumped from the outdoor condenser coil and compressor through the copper tubing to the indoor unit or units. Inside, the refrigerant is drawn across the evaporator coil and humidity is removed and the air is cooled. A fan in the indoor unit then pushes the cooled air into the room. The amount of cold air entering the room can be controlled by a thermostat or it can be regulated by an infra-red remote controller, similar to a television remote controller. Contact us to schedule a complimentary appointment to see if a ductless mini-split is the right choice for you.